Smartageness - Cars! Cars! Cars! The proposed Smart price is downright stupid. $15-20K? You HAVE to be kidding! This, as even now, Europeans are plunking down a mere 10-16K Euros for Smarts. And why all the shilly-shallying around? There was plenty of demand for Fortwo six years ago. Now I read that the Fortwo WILL NOT be sold by Mercedes dealers in the USA. Are they mad? The fancy glass cake-boxes used by an independent sales-chain to sell Smarts in Europe were a dismal failure at getting people to buy Smarts. I guess Mercedes execs will NEVER learn how to market this car. 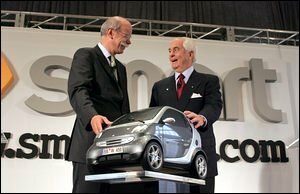 Main reason I want a Smart is the SIZE. I need the room in my garage for other toys. Hey Honda! Bring back the original N600! I'm going to find a sub-comact that fits MY needs, but I don't want to die of old age waiting for Smart. A Chinese Goggomobil, maybe? Cool! Will it have a Garmin GPS like other smart cars?